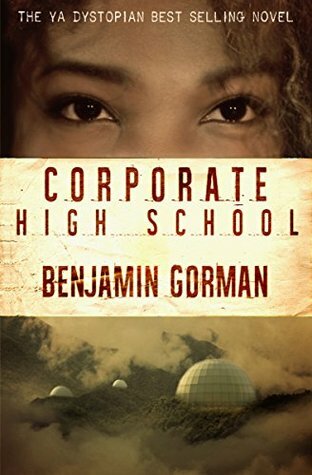 Gorman’s gut-wrenching satire delivers the lesson that when a school is not a school, learning is rebellion and knowledge is a weapon. The book opens with Harriet Washington facing a challenge typical of much teenage fiction: because of a parent’s transfer, the family has to move; she has to leave her friends behind and start over in a new town at a new school. The twist: this is happening in a dystopian 22nd-century America, where The Corporation controls everything — the courts, the prisons, the schools, commerce, communications . . . The government ceded so many rights to corporations that they eventually had more rights than human beings. Unregulated, they merged and acquired until one massive entity rules all. It’s a totalitarian surveillance police state . . . with shopping malls and football and school dances. In a nod to Dickens, Harriet’s mother is in prison for nonpayment of debt. Harriet and her father leave Illinois for Oregon to be close to her and Dad requests Harriet to keep a journal of her experiences — on paper in a notebook, not online, to avoid the eyes of the Corporation. She experiences typical high school drama as she makes friends, has a crush, plays matchmaker, and falls in love. Gradually, she becomes aware that she’s not being told everything even by those she trusts. There are secrets and plots behind everything, but she isn’t brought into the know until late in the book. All this is told in the appealing voice of a young woman who is, in her own words, “anxious about everything.” Gorman, a high-school teacher, has clearly been paying attention to his students. She has a lot to be anxious about. The story illustrates the repercussions of issues we face today. In 2115, climate change has affected everything — geography, architecture, transportation. “Flood” is one of many banned words (so kids use it as a swear, a clever way of implying profanity while keeping the language of the book clean). In the corporate high school, all Harriet’s classes are test prep classes. The students are openly taught only what they need to know to pass standardized tests (written by the same Corporation that runs the schools). Football players are allowed to get concussions until they are of no more use. The sweet irony is that teenagers are still teenagers; they will rebel, and in this setting, they rebel by actively seeking out knowledge they’re not getting at school and use printed books — especially the works of Shakespeare — to exchange coded messages within an underground movement that’s working to undermine and destroy The Corporation. I was hoping to see Harriet take more of an active role in the secret plot, rather than being kept in the dark until near the end. The ending implies the possibility of sequels, though, so I may get my wish. I received an advance review copy of this book in exchange for an honest review and blurb.